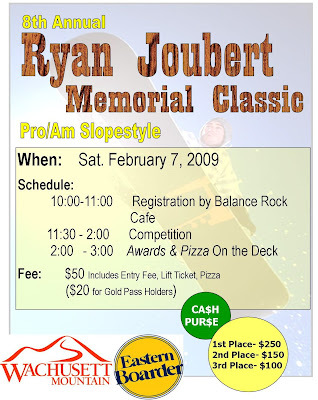 So here we go again with another fun slopestyle event for all at Wachusett on the 7th. Head to head riding for cash and prizes. We'll pick a few of the better features in their park to session on for a while ..keep things loose, give out some stuff, have a little pizza, and call it a day. Ryan Joubert was a great kid and friend of many in the area. His passing a few years back isn't forgotten. The Joubert family was the driving force in creating the Ryan C Joubert Memorial Skatepark in Fitchburg too. 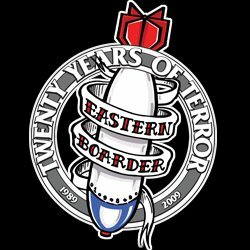 So come on out, take a few runs and have a few laughs with EB and the crew from Wachusett Mountain. Please make it on time for registration so we get going on schedule.